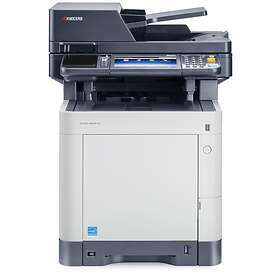 The Kyocera ECOSYS M6235cidn Copier, Printer, Scanner combines exceptional color printing with the flexibility to output finished documents that make an impact! Enjoy fast speeds of up to 37 pages per minute in color and with robust scanning and copy capabilities that improve workgroup productivity. The device’s abilities can be expanded with the addition of integrated business applications that can simplify document workflow while providing added power and performance. Kyocera’s advanced, award-winning ECOSYS technology is well regarded as a cost-effective and highly reliable solution. Energy use has been reduced and most replacement parts eliminated or replaced with long life components. With the this model you can enjoy the benefits of document imaging devices that lower operating costs, minimize downtime, and maximize efficiency. LCD or LED screen depending on model.